When you step into the cab of a Bobcat® compact (mini) excavator, you’ll see premium comfort features everywhere you look. 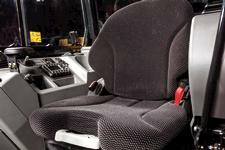 That’s because a more comfortable cab can contribute to fewer breaks on the jobsite and longer working days, both of which increase your productivity. No detail, big or small, has been overlooked. When you step inside the redesigned cab of a R-Series compact (mini) excavator, you’ll find more space everywhere you look. It provides maximum headroom and legroom for dependable comfort all day long. Additionally, the suspension seat is wider and floorspace has been increased by 29 percent when compared to previous generations. 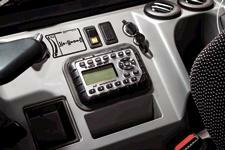 Even tall operators will be comfortable with plenty of headroom. When you have clear visibility to your work area, your productivity can take off. 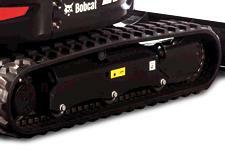 Bobcat compact (mini) excavators are engineered with narrower cab pillars and more glass surface area. We give you the industry’s best visibility to your workgroup and blade cutting edge. Set your temperature and forget it. With the optional automatic climate control, your machine automatically adjusts to keep you comfortable, freeing you up to focus on your work. When it’s cold outside, the heated seat makes a perfect complement to the automatic temperature control, keeping your body warm on frigid days. 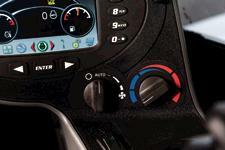 Inside the premium cab of R-Series compact (mini) excavators, you’ll experience dramatically reduced vibration. Many features contribute to the improvement, including a dual-flange track roller system, a tighter connection between body panels and robust hinges and latches. They all work together to make operating your Bobcat compact excavator more comfortable for longer, more productive days on the jobsite. 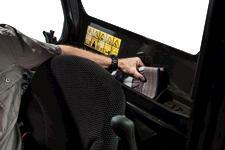 Simple, ergonomic controls keep you productive all day long. 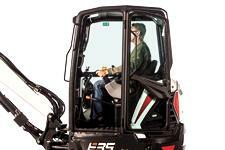 Control your attachments and travel with precision, flexibility and low fatigue. Feel the quality at your fingertips, as the newly designed joysticks fit better in your hands. No matter your height or weight, it’s easy to find a comfortable operating position with multiple adjustment points. Find the perfect position by moving your seat backward or forward. 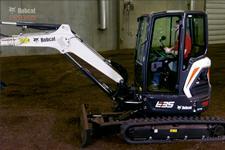 Order your excavator with a stereo to enhance your workday. 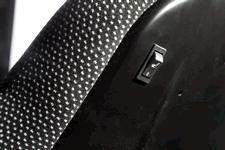 The radio features an auxiliary audio input jack that is ready for an MP3 player or other device. Storage bins are located throughout the interior. You can store items wherever it’s convenient – on your right or behind you. Keep your beverage in one of the two large cup holders. Easily remove the rubber floor mats from the excavator for cleaning. Use a hose or pressure washer to remove dirt, dust, and other jobsite grime. If you work on a busy jobsite, you know that noise exposure around you can be a daily frustration. Quiet equipment will make you happier at the end of the day. 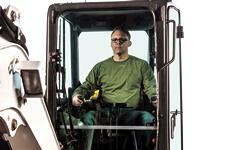 Bobcat® compact (mini) excavators maintain best-in-class performance, while keeping noise levels down. However, not every manufacturer maintains the same standards. See how Bobcat compares to Kubota® in this unofficial sound test.